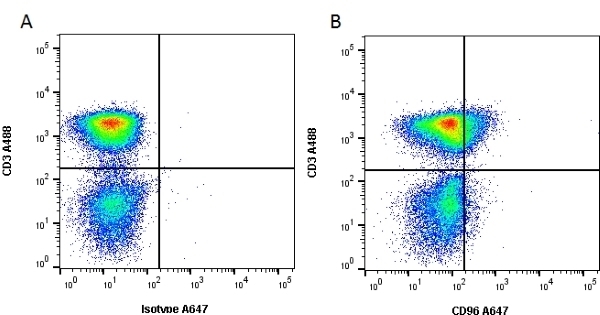 Mouse anti Human CD96 antibody, clone NK92.39 recognizes human CD96, otherwise known as Tactile (T cell-activated increased late expression), a type I transmembrane glycoprotein expressed at low levels on peripheral resting T and NK cells, which increases following activation. CD96 stimulates the cytotoxicity of activated NK cells, and promotes the adhesion of NK cells to target cells expressing CD155/poliovirus receptor (PVR) and the transfer of target cell PVR to the NK cells. CD96 can be used in the immunophenotyping of T-cell acute lymphoblastic leukaemias (ALL) and acute myeloid leukaemias (AML), and may play a role in the recognition of CD155-expressing tumours by NK cells. Mouse anti Human CD96 antibody, clone NK92.39 blocks the binding of soluble CD155 to NK92 cells (Fuchs et al. 2004). Natural killer 92 (NK92) cell line. Fuchs, A. et al. (2004) Cutting edge: CD96 (tactile) promotes NK cell-target cell adhesion by interacting with the poliovirus receptor (CD155). J Immunol. 172 (7): 3994-8.